The Hastings Way reconstruction project could very well be one of the most important issues facing the Eastside Hill in years. This is our chance to fix that giant concrete river bordering the neighborhood, dividing us from the businesses on the other side, creating an intimidating and dangerous rift, inhospitable to pedestrian and bike traffic. This is our chance to remake it into something we’re proud of. The next meeting on the project is an important one and might be your only chance for input! Wednesday, June 16, 4-6:30PM, Regis High School, 2100 Fenwick Avenue, in the cafeteria. It’s a workshop to sit down and really go over ideas and concepts for the Hastings Way reconstruction project, sketching things out and providing valuable input. Participants will be in groups at tables and can envision whatever they’d like to see for the street together, then show those ideas to the rest of the group. It should be very creative, fun, and interesting. And, hey, light snacks and refreshments will be on hand. The project involves 1.4 miles of Hastings Way from Clairemont Avenue north to the Eau Claire River bridges. 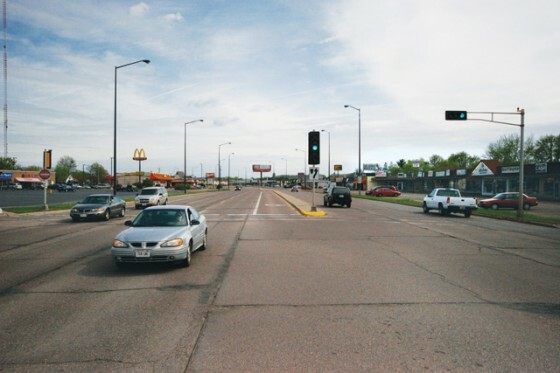 The land use planning and roadway design development will occur over the next six (6) months with a goal to have a final concept design approved in the Fall of 2010. Construction is planned to occur from April – October, 2011. Since the opening of the new Highway 53 Freeway, average annual daily traffic volume in the section south of Main Street has decreased 56% from 48,300 in 2003 to 21,100 in 2008. At the present time it is not anticipated that any business or home acquisition or relocation will be required for the project. This is seriously one of the last chances to offer input. If you’d like some inspiration for what’s possible with a strip of road like Hastings Way, Volume One Magazine has some great articles and mock-ups here and here. You can find a Facebook event page here.